Congratulations justly owed to Shawn Crawford, the Sage of Tulsa, for his landing of a regular Monday column at 3 Quarks Review! 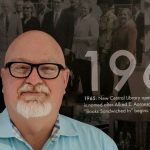 Shawn recently became Executive Director of the Tulsa Library Trust and the Helmerich Distinguished Author Award. A loyal friend and valued colleague, he has recently promised to open his eyes next time his picture is taken. Seriously--this is a reason to look forward to Monday! We respect your privacy. None of the information you provide will be disclosed in any way. Thank you! I'll do my best to entertain and inform!